Ellie Mae is N.A.B.S.' third service dog. This is a new kind of project where the family will 'foster' their own dog and we will go over to their house to work with them. Ellie Mae is being trained for a little 8 year old boy, Michael Evans. One of our volunteers met the Evans family at a bookstore over a year ago. Michael has Asperger Syndrome, a high functioning autism, and although he has seizures and other problems, he is very smart and such a sweetie. Mostly the service dog is to help him adjust to getting out of the house and going into public places without feeling stressed or overwhelmed. By concentrating on the dog, Michael should be less focused on strangers since their attention will also be on the dog. Michael’s mom has to arrange for a sitter for her son if she is to go anywhere outside the home. Her dream is for Michael to have the freedom to be able to go along on all the family’s outings. His parents are wonderful people and we were thrilled to be able to get a service dog ready for him. We watched for what we thought would be the right dog for over a year, but didn't find anything until Alvin Animal Clinic directed someone to us. Alvin Animal Clinic lead receptionist, Jennifer Hollier knew we were looking for a Standard Poodle or Giant Schnauzer mix at the shelters in the area in order to rescue one whose personality met the criteria for being a service dog. Jennifer placed a call to a Standard Poodle breeder who occasionally donates young adult dogs or a puppy to service/therapy work. The donors, a husband and wife team who raise top quality Standard Poodles wish to remain anonymous. They say they feel led to give back part of what they are blessed with, so they donate a puppy when they learn of a person who qualifies for a service or therapy dog. This lady had a litter of puppies and wanted to donate one to become a service dog. Upon hearing the news a little Alvin boy needed a service dog, the couple immediately contacted us. They graciously offered to give one of 5 available puppies to the child. After careful screening, a beautiful registered puppy was chosen once it was evaluated to be the best candidate for Michael’s specific needs. 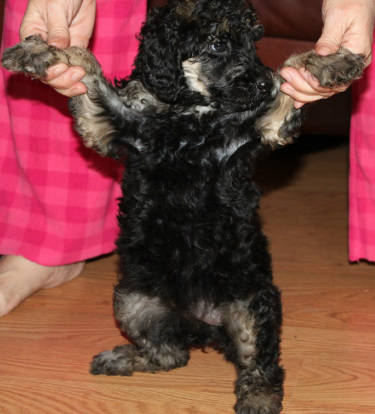 We ended up receiving a beautiful, healthy, registered Standard Poodle puppy. We thankfully accepted the generous offer, and the wheels were set in motion for Ellie Mae to receive service dog training from us when she is grown. This was just in time for Michael to have as a Christmas present and then we came up with the idea of having Santa Claus bring Michael his service dog! Santa Claus came to town a little early in Alvin, Texas! That’s right! 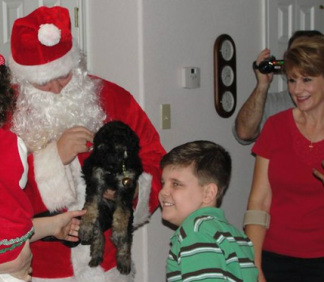 He made his list and while checking it twice decided to make a special delivery to a very good little 8 year old boy, Michael Evans, son of Tom and Pam Evans of Alvin. Michael has been waiting over a year for what Santa had in his bag and he finally gave up on getting what he wanted. But Santa didn’t forget, and this year things changed! 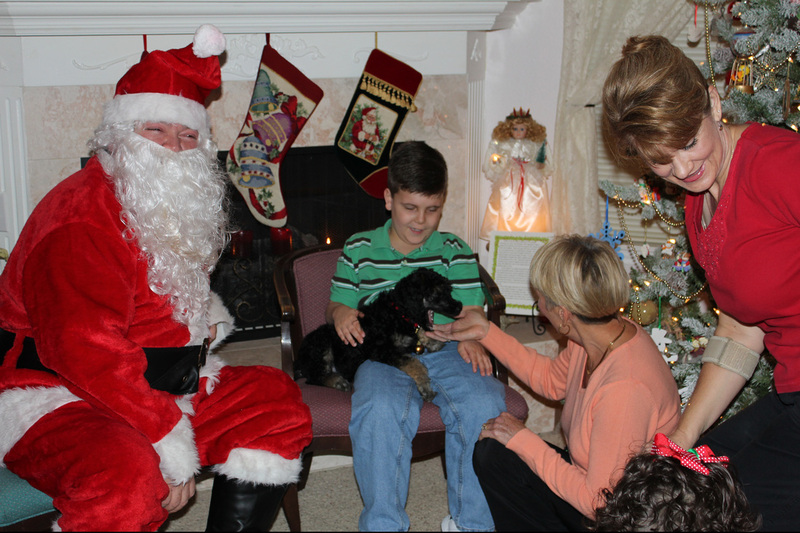 Santa surprised Michael with an 8 week old black fluffy puppy intended on being a service dog once it is grown. Michael’s family had planned a Christmas party for Santa. Their yard was lit with lights and the tree was trimmed with care. The array of goodies for Santa included homemade cookies, homemade fudge, cake balls, pizza, all kinds of other Christmas treats like hot chocolate and hot apple cider. Family and friends had gathered for the festive occasion. Ellie Mae will begin receiving formal training in 2014. If not for our volunteers, a fully trained service dog could cost over of $35,000, but because of the hard work of our volunteers and the big hearts of our local veterinarians, the cost is reduced to around $3,500. We could not have accomplished any of this without the support and contributions of three local veterinarians: Dr. Gregg Knape, of Gulf Coast Large Animal Clinic, Dr. Amanda Hoffpauir of Alvin Animal Clinic, and Dr. Robert Langley of Dr. Bob’s Animal Hospital. These veterinarians have donated their time and services to make sure the animals being selected are also healthy and sound. They do physical exams, hip x-rays, and provide other medical services to make sure the candidate is strong and healthy prior to a year of training. The puppy was given to Michael at no charge to the family! Ellie Mae is still maturing and we are hopeful she has what it takes to become a service dog. Michael tattles on his playmate, "Mom! Ellie won't let me swing!"